Snapshot #1: This first shot shows a little counter to the left of my entrance with a craft sink which just happens to be my favorite addition to my space. It's been wonderful for cleaning up paint and ink projects. My family likes to joke that all I need is a micro/fridge with a cot and I just might never leave. ;) Snapshot #2: The next photo shows my custom made movable island that has (4) 12x12 hanging file drawers on one side and shallow 12" shelves on the backside. The cabinets to the right, along the wall make up my die-cutting station. I love that I'm able to store all my dies in the cabinets there within arm's reach. Snapshot #3: The next photo moves to the right of my die-cutting station and is the place where I spend the majority of my day. It was important to me that my counters be 24" deep to give me extra storage space along the wall and still have room to work at my computer and assemble my cards & scrapbook pages when the keyboard is pushed out of the way. Shapshot #4: Moving along to the right again I have another seating area to keep my sewing machine out. For those who know me, I love to sew on my paper craft projects so after years of balancing it on my washing machine and standing up to sew, it was really important to me to have a dedicated space for my machine. I also store all my inks and stamping supplies in the cabinets in that corner. The last storage spot in my space that I don't have a good picture for is two side-by-side closets to the right of my room entrance. My closet doors swing open so I have added the Elfa Pantry Door Organizers from The Container Store to the insides where they can be hidden away. I'm seriously in love! They can be customized in a dozen different ways--I was able to fit 8 hanging wire baskets on mine in three different size). 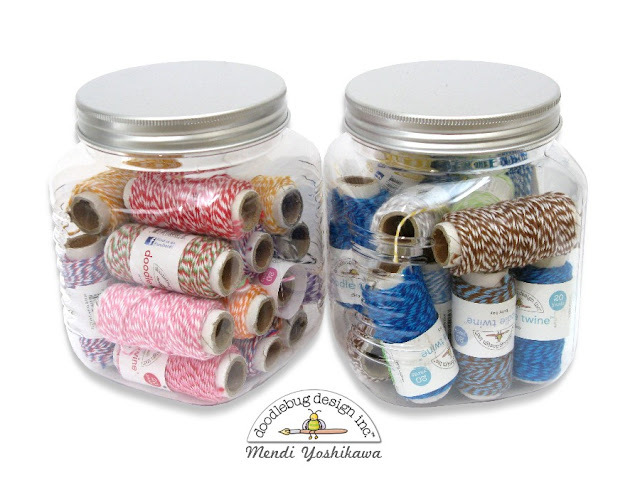 They're perfect for fitting extra embellishments and maximizing tight spaces that would otherwise be wasted. 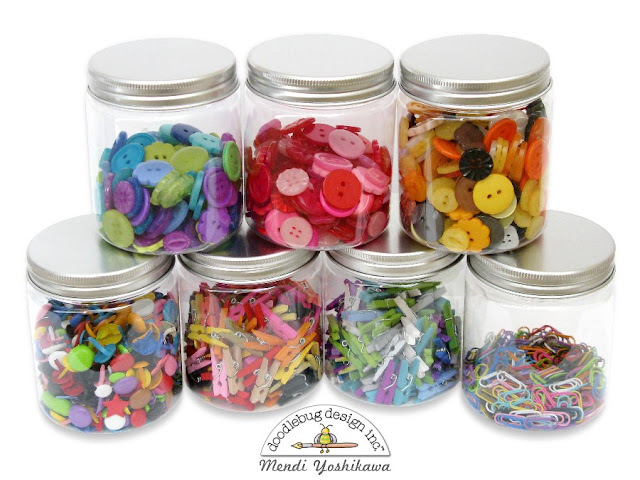 I like to use Doodlebug's Button Keeper jars to hold many of my small basic Doodlbug embellishments. I sort them by color family and am really happy with how much space they save. It's truly amazing how much extra room the packages were taking up and how much easier it is to dump them out in my hand and just pick the colors I'm looking for. They also are a great fit with my Elfa medium basket. I use some larger plastic jars to hold my Doodle twine (the Droppar jars from IKEA would also work nicely). 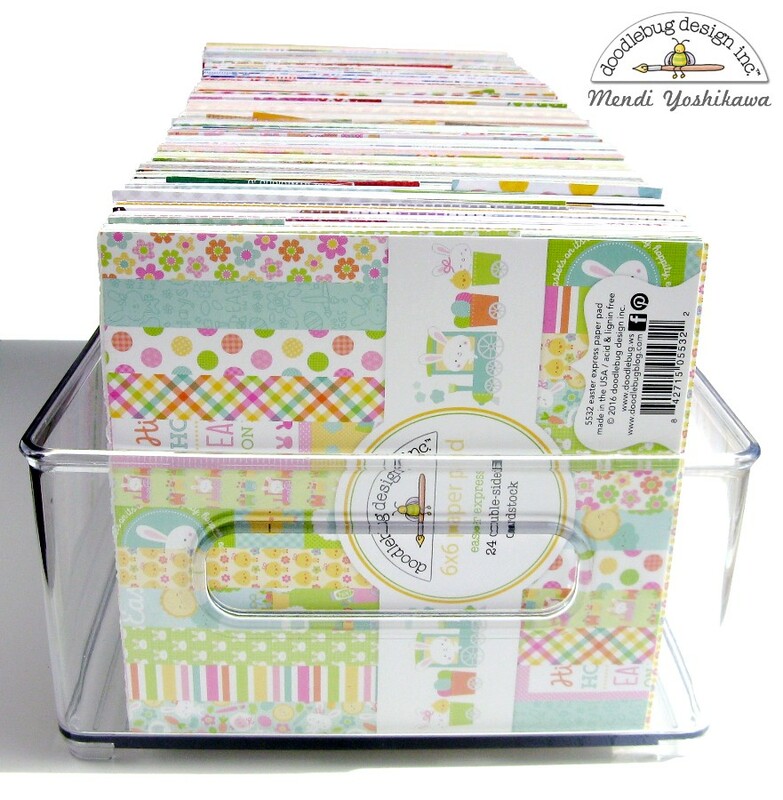 They are a great size for so many things (including sorting washi tape by color) and I am able to perfectly fit four of them in one of my large Elfa utility baskets. 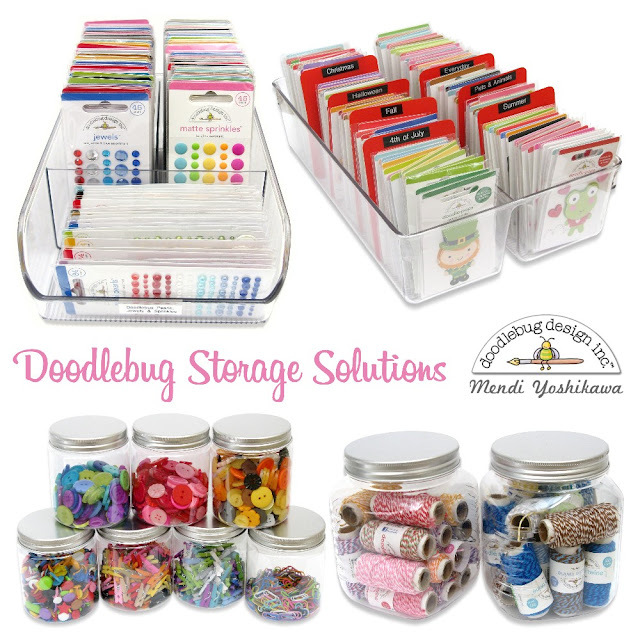 Next up, I have some storage solutions using some of my favorite Interdesign / Linus clear acylic storage bins. 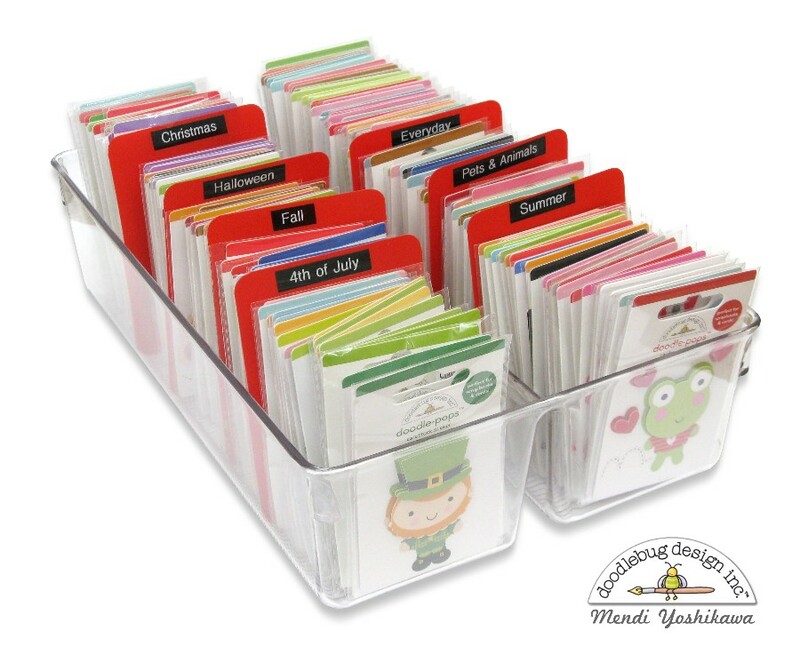 Most of these have been designed with the kitchen and refrigerator in my mind, but they are wonderful at organizing so much more. I can't go to Ross, Marshalls or TJMaxx anymore without scouting to see if they got some new ones in stock. I love to use THIS large 8" x 4" x 14.5" bin to hold my Doodlebug 6x6 Paper Pads. I counted and I'm able to fit in 55 pads in one tidy space! To keep my loose scraps together with their coordinating pads I use THESE clear party favor bags which I trim down to 6" long and tuck under the front cover of each pad. 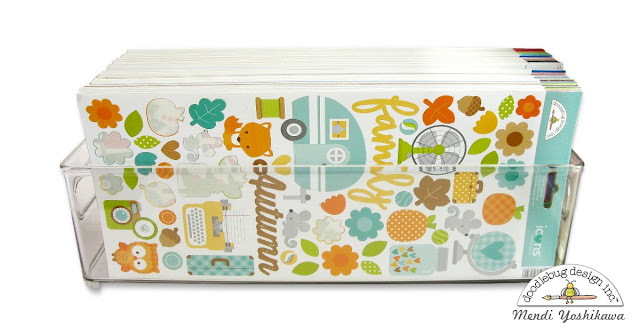 For my 6x12 Alphabet and Icon Cardstock Stickers, I use THIS 4" x 4" x 14.5" Freezer Bin. It's a great length and they are easy to sort by color and theme. Once again, I love that I am able to fit so much in a tight space and still quickly find exactly what I'm after. Up next is a tip for storing Doodle pops. Hello my name is Mendi and I have a Doodle pop addiction. Linus Drawer organizers are so perfect for this task. For my little dividers, I cut up some plastic file folders and rounded the corners with my corner chomper and then labeled them with my Brother label maker (which was completely inspired by how Jennifer McGuire stores her clear stamps). ;) To keep my Doodlebug sprinkles, jewels and pearls tidy I love THIS divided organizer. 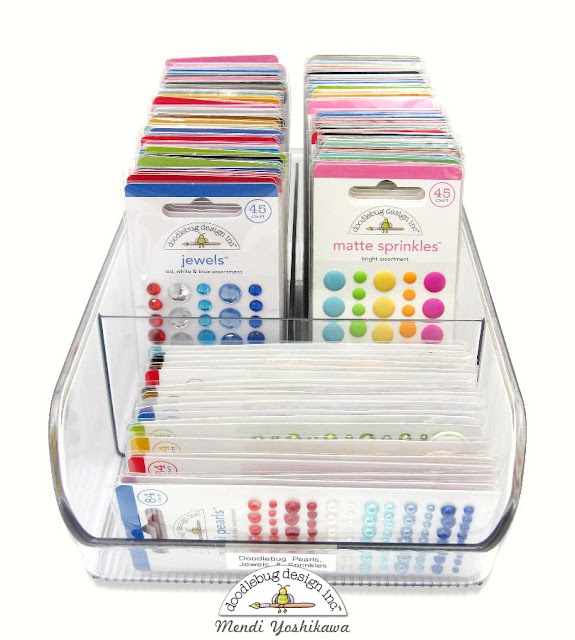 It's just the right size for these and would work well for a variety of small embellishment packages. This is fabulous Mendi! The sink is an awesome idea!!! Gorgeous space!!! Lovin' your Doodle storage too!! 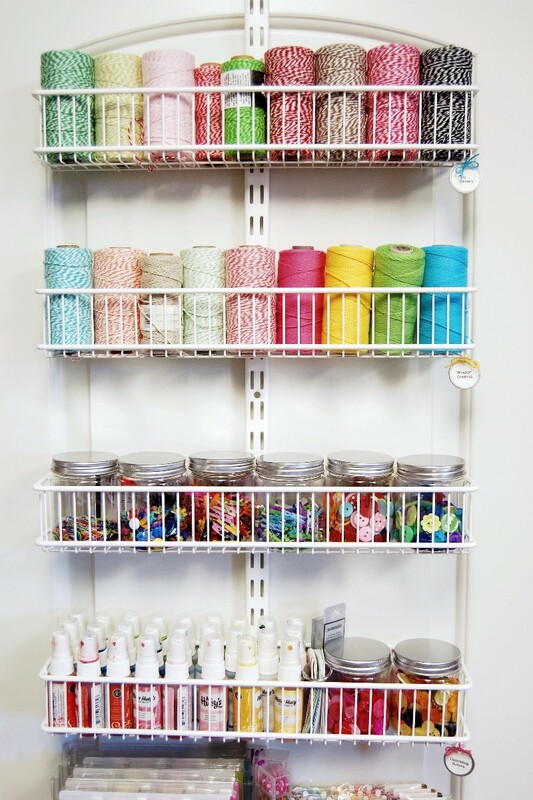 Love your craft room that has everything even a sink! Love the that the room is open with lots of space and storage! Beautiful! Terrific looking space, Mendi! Those freezer bins are a great idea! What an awesome room Mendi!! So large and so clean and organized! How fun to see it! Thanks for the tour!